CM Magazine: Inventors. (Great Canadians). The immune system is the collection of molecules and cells that help the body fight disease. Julia (Levy) was researching ways of increasing the immune system's ability to fight cancer. Her work was going well, and she needed to make an arrangement with a pharmaceutical company. The company would then be able to manufacture and sell any medical drugs Julia's team invented. This way the drugs would be widely available to patients. Carlotta Hacker's has taken a brief look at six Canadian inventors and a cursory look at twelve more. The style is much like the A&E network's approach to biographies: upbeat, folksy, and selective. The six primary inventors profiled are Alexander Graham Bell, Wilfred Bigelow, Joseph-Armand Bombardier, Hugh Le Caine, Julia Levy, and James Naismith. It is hard to determine why this group was chosen. There is lots of information available at this level on Bell, and some on Bombardier. However, the information on the remaining four less familiar inventors is an asset. The additional twelve featured in the addendum, "More Great Canadians," will serve to spark the interest of readers. This addendum is followed by a glossary, list for further reading, and an index, all helpful additions to this title's readers. The text is organized into segments. Some information is found in boxes such as a list of "Key Events." This is a list of dates of important events in these inventors' lives. Other information presented in boxes are a story from their childhood and one called "Backgrounder" where some brief information is given on "Electronic Music" in the case of Le Caine or "Why Were Snowmobiles Needed?" for Bombardier. The remaining information is given in a chronological narrative. The use of these segments or boxes should interest the students who like this style, but there are not so many that the reader gets lost. Each piece includes some technical discussion of the inventor's invention. In a few cases, this discussion does challenge the reader and may make this a more challenging read than other titles in this series. Yet the fact remains that the book is well written and will appeal to the age group for whom it is intended. 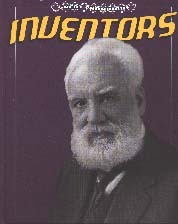 This book was interesting reading, and will benefit collections needing a boost in the Canadian Inventors section. Ruth McMahon worked as a professional librarian for 13 years and is currently co-chairing Alberta's Rocky Mountain Book Award.